that generates beautiful patterns and melodies for your sounds. 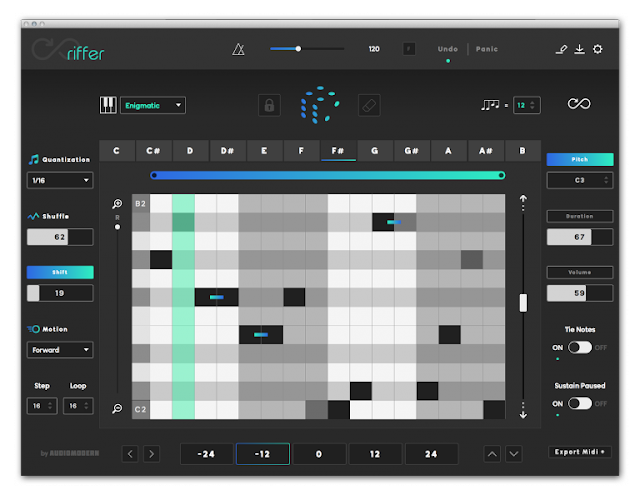 Riffer comes in VST & AU format and it is designed to feed anything that accepts MIDI signal, both Software & Hardware. Built for your sounds, synths, basslines, beats, etc.. Choose from 50+ scales, pattern complexity, steps, start and end points, set pitch, transpose, motion, measures and many more. You can Export the MIDI Using Drag and Drop, Or when using the app version, you can send MIDI over Wi-Fi, or select CoreMIDI for inter-app communication and to feed any compatible hardware. Riffer is built both for studio and live performance. Designed to feed anything that accepts MIDI signal. FREE PLUGIN and Killer Special Offers! SOUNDIRON Horror Bundle 65% OFF- Limited Time!